Pictures of Australia - New South Wales/A.C.T. 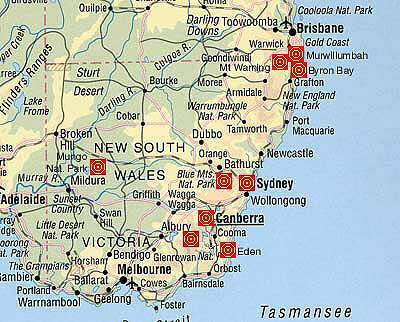 New South Wales covers an area of 802.000 square kilometers. Here Captian Cook landed in 18th century. With 6,2 million inhabitants New South Wales has the highest population in Australia (value in 1998). The Australian Capital Territory consists only of the Australian capital Canberra and was built right between Sydney and Melbourne for some diplomatical reasons.